A college basketball player presents with a more than 1-year history of pain and disability in his knee. He was pain-free after a 6-week course of non-operative treatment – but then he began playing basketball again and the pain returned. Should surgery be the next step? The author has no disclosures relevant to this article. Tendinopathy of the patellar tendon is among the many painful disorders of the patellofemoral joint that affect athletes. Although usually thought of as a disorder at the inferior pole of the patella only, jumper’s knee is now recognized as also occurring at the superior pole of the patella and at the tibial tuberosity insertion of the tendon. Athletes involved in high intensity leaping sports, such as basketball and volleyball, are typically at greatest risk for jumper’s knee, but it can occur across a spectrum of sports. Conservative management remains the foundation of care, with most athletes returning to full participation after a short period of treatment. Occasionally though, surgery is warranted for refractory cases, particularly in patients with high-grade partial tears and complete tears. Fortunately for athletes, these types of tears infrequently occur. Open and arthroscopic approaches have been described, with good to excellent results in most cases. The following case illustrates the presentation of a patient who underwent successful treatment with an open approach. A 19-year-old college basketball player presents with a more than 1-year history of pain and disability in his knee. Although he cannot point to a specific history of injury, he notes that the pain had intensified over the course of his previous basketball season. This had necessitated a 6-week period of physical therapy and rest. He participated in summer conditioning drills, but his symptoms returned shortly after the start of the most recent basketball season. The patient’s complaints include pain with activity and a sense of the knee giving way, but no swelling, locking, or buckling. Conservative measures, including ice, rest, and the use of non-steroidal anti-inflammatory drugs (NSAIDs), resulted in only temporary relief. Figure 1. Tendon and bone involvement at the inferior pole of the patella. Because the patient had already undergone an unsuccessful extended period of conservative management, surgery was recommended. Diagnostic arthroscopy was performed. There was no medial plica, and the fat pad was not thickened. The patella tracked normally. There was no evidence of hyperemia, partial tearing, or chondral scuffing at the inferior pole of the patella. A 4-cm incision was made over the inferior pole of the patella and the patellar tendon was split in the midline. An area of hemorrhagic tissue was identified and excised. Calcifications were also seen in this tissue. Sharp debridement of additional degenerative appearing tissue was performed. The inferior pole of the patella was gentle debrided with a rongeur. A 3.0 suture tack was place in the inferior pole of the patella, and the patella tendon split was repaired with paired, 2-0 FiberWire sutures.The underside of the patella was intact, with no evidence of softening or fibrillation. The tissue specimen sent to pathology was found to contain fibroconnective and fibroadipose tissue with chronic inflammation, granulation tissue, and degenerative change consistent with chronic tendinitis. The patient was placed in a bulky postoperative wrap, which was removed after 2 days. Early range-of-motion (ROM) exercises were begun. The patient was allowed to resume light running at 6 weeks and weight training at 12 weeks. He returned to sports at 3 months. Jumper’s knee is commonly felt to be an overload failure at the bone tendon junction, with necrosis and degeneration seen microscopically on both sides of this junction. Surprisingly, there is little active inflammation seen, thus calling into question the role of NSAIDs in managing this condition. Direct impingement by the inferior pole of the patella has been proposed as a cause as well. Worp et al have identified demographic risk factors associated with the development of symptoms. In this patient, hamstring tightness was identified. Traditionally, jumper’s knee has been considered to occur at the inferior pole of the patella. Recent reports, however, have shown that it can also occur at the bone tendon junctions at the superior pole of the patella and the distal insertion on the tibia. Little is written, though, about differential treatment and results. The hallmark of jumper’s knee on clinical exam is tenderness over the inferior pole of the patella with the knee in extension, with the pain improving on flexion. The extent of tendon involvement may make this finding extremely variable, however. 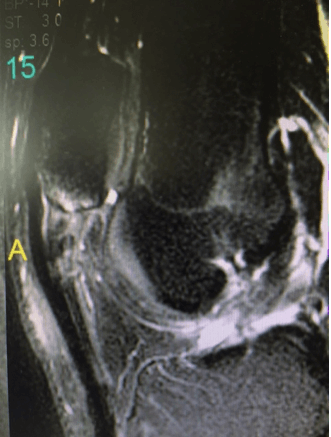 If a patient has jumper’s knee, the MRI should show signal change at the bone tendon junction, although this may vary with extent of involvement as well (Figure 2). Figure 2. Signal change at the bone tendon insertion. Conservative management remains the cornerstone of care, with reduction of high-stress activity, eccentric stretching, and efforts to address demographic risk factors being key components. Modalities such as ice are helpful in symptomatic relief; however, simply reducing symptoms without allowing for healing may actually worsen the condition. Likewise, the use of NSAIDs is called into question, as inflammation seems to play little or no role in this process. Cortisone injection, while helpful in short-term treatment, has poor long-term results. The risk of tendon rupture following injection, combined with these results, should make one reticent to consider their use. A variety of surgical treatments have been found to be effective, including open debridement with or without direct repair, arthroscopic debridement, and in cases of inferior pole impingement, partial excision of the distal patella. Future options include biologic injections such as plasma-rich protein. Although early research is promising, the usual caveat of “more research is needed,” is part of the usual conclusion of these studies. Christopher M. Aland, MD, is a board-certified orthopaedic surgeon with The Rothman Institute, Philadelphia, Pennsylvania. He specializes in arthroscopic treatment of shoulder disorders, particularly rotator cuff tears, as well as treatment of knee conditions including anterior cruciate ligament tears and meniscal pathology. A. Ferretti, E. I. (1983). Jumper’s Knee. American Journal of Sports Medicine, 58-62. A. Romeo, R. L. (1999). Arthroscopic Treatment of Infrapatellar Tendonitis. Arthroscopy, 341-345. A. Schwartz, J. W. (2015). Patellar Tendinopathy. Sports Health, 415-420. H. Worp, M. A.-S. (2011). Risk factors for patellar tendinopathy: a systemic review of the literature. Br J Sports Med, 446-452. J. Kettunen, M. K. (2002). Long term prognosis for Jumper’s Knee in male athletes. American Journal of Sports Medicine, 689-692. J. Roels, M. M. (1978). Patellar tendinitis (Jumper’s knee). American Journal of Sports Medicine, 362-368. Johnson, D. (2003). 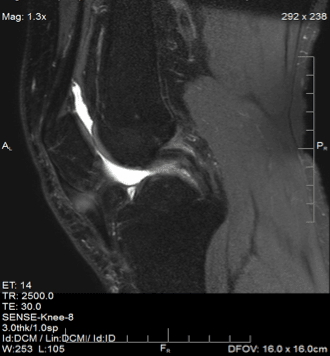 Ten year results of arthroscopic surgery for patellar tendonitis. Arthroscopy, supplement, 41-42. M. Brockmeyer, N. D. (2015). Results of Surgical Treatment of Chronic Patellar Tendinosis (Jumper’s Knee): A Systematic Review of the Literature. Arthroscopy, 2424-2429. M. Schmid, J. H. (2002). Is impingement the Cause of Jumpers Knee. American Journal of Sports Medicine, 388-395.